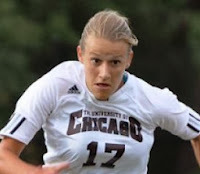 CHICAGO (Oct. 30, 2013) -- Eclipse Select Soccer Club alumna and University of Chicago senior forward Natalia Jovanovic (Gurnee, Ill.) earned University Athletic Association Athlete of the Week honors. Jovanovic scored both goals, including an overtime game-winner, in last Wednesday’s 2-1 victory against the University of Wisconsin-Oshkosh. For the season, Jovanovic has five goals and eight assists. In other alumni news, Michelle Prokof (Gurnee, Ill.) scored her eighth goal of the season to lead TCU to a 1-0 win against Iowa State last Friday in Big 12 play. ... Goalkeeper Aryn Newsom (Manteno, Ill.) made five saves in a 3-0 win against Drake as Illinois State clinched the outright regular-season title in the Missouri Valley Conference on Sunday. ... Former Florida State defender Casey Short (Naperville, Ill.) is joining the National Women's Soccer League's Chicago Red Stars for 2014.